Solid-state radar brings the power of today’s technology to an old solution. The pilothouse was in night mode, screens dimmed. A low-hanging curtain of clouds magnified the darkness that seemed to swallow the boat and gave the deck underfoot the advantage of surprise with its erratic movements. 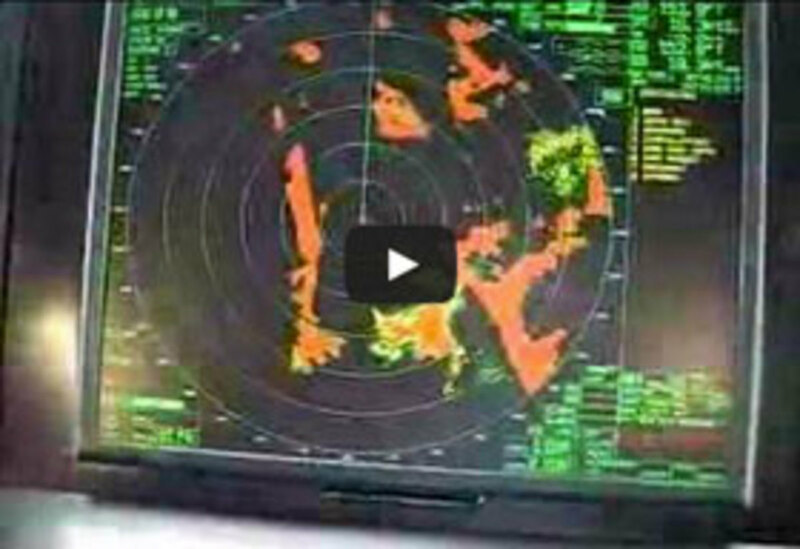 Watchstanders kept a weather eye on the AIS, plotter, autopilot, and radar. Squalls and ships, tugs and tows, even waves breaking on a reef show up on that radar. And unlike the electronic chart or the AIS, radar doesn’t show an idealized version of the world beyond the pilothouse windows. Instead it pings back just the facts, such as they are (if you’re able to interpret them): traffic and weather, buoys, land, even birds. The value is unmistakable to experienced boaters who read these displays closely and have faith in what they see. 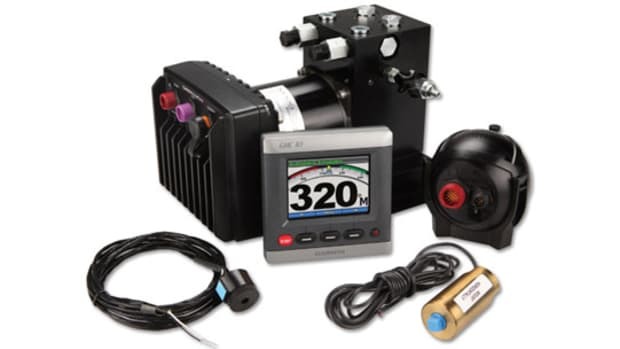 The trust boaters place in the information that instruments provide is a key part of letting electronics help extend our safe boating time well into the dark hours and foggy days. New technologies may be a welcome addition to the cause, but will they—or should they—replace the proven performance on which we’ve relied for years? Since pulse-compression radar left the limitation of military service five or so years ago, marine-electronics companies have been looking at incorporating the system into recreational helms. 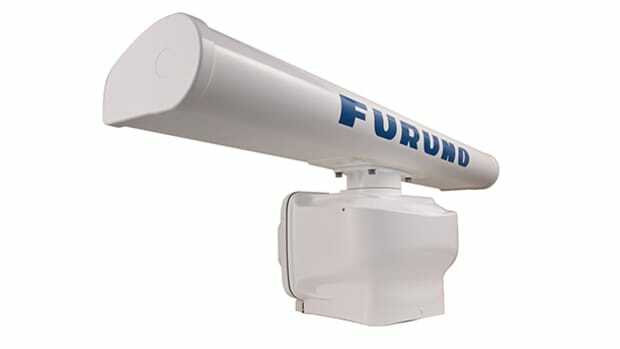 Most marine radar signals from both solid-state and conventional pulse radar operate within the X-band. 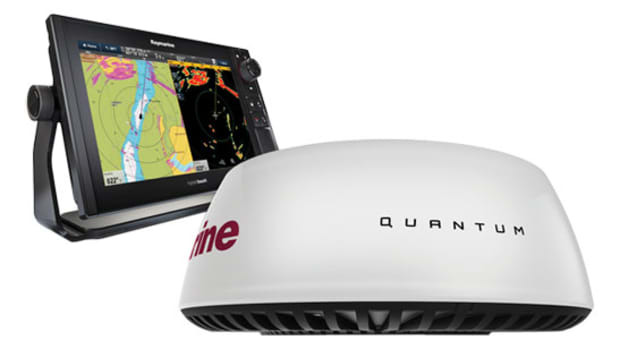 Navico (parent to Simrad, Lowrance, and B&G electronics brands), Furuno, and U.K.-based Kelvin Hughes all have solid-state radar systems, but so far Navico is the only one to bring a system for recreational boaters to market: Broadband radar, now in its fourth generation. 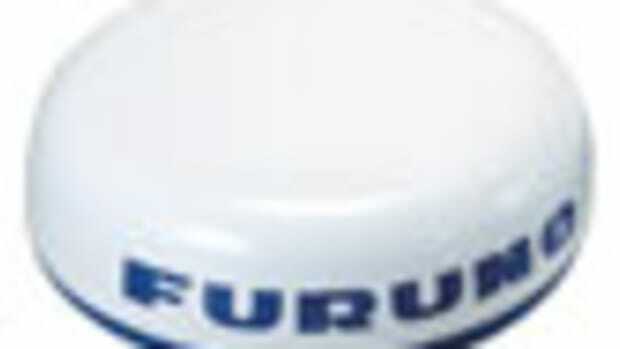 Furuno (www.furunousa.com) has an S-band radar available for commercial vessels and has an X-band system in development, also for the commercial side. The Sharpeye system from Kelvin Hughes is also for commercial application. With regard to solid-state radar, a Raymarine representative says the company has nothing to talk about right now. 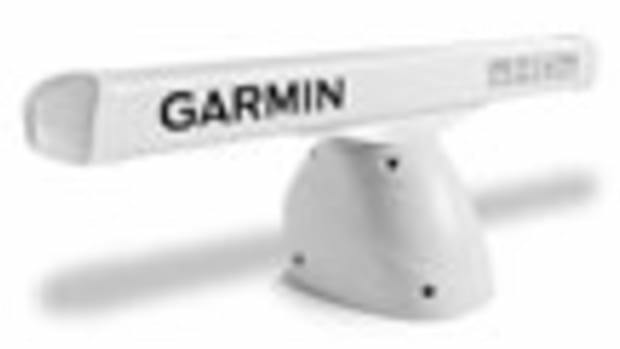 Garmin has a system for aircraft radar, but so far also has given no indication of development for marine customers. 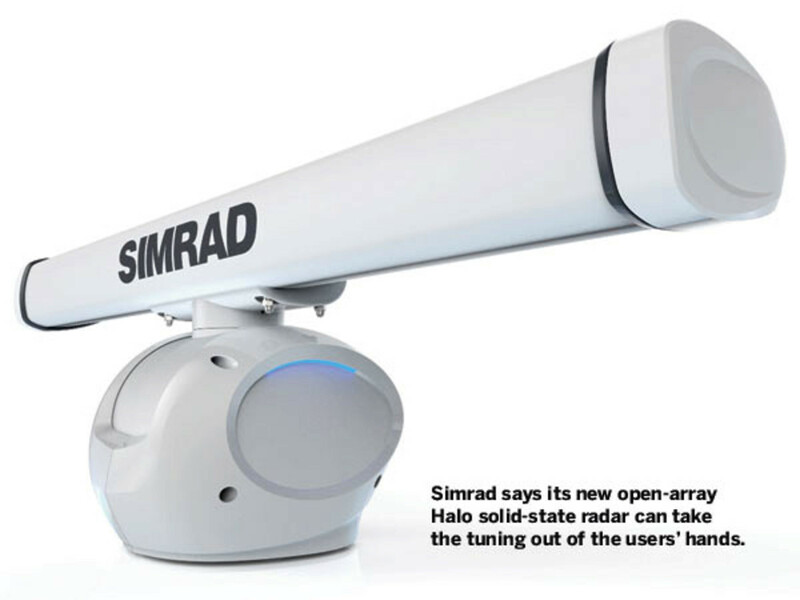 The latest addition to the field is an open-array radar series from Simrad (www.simrad-yachting.com), dubbed Halo, that is designed for recreational boats. It aims to use solid-state radar technology to improve on many of the features we’ve come to take for granted from conventional pulse radar. Whether these radars succeed or not remains to be seen—the stated goals are lofty. The series consists of three models including 6-, 4-, and 3-foot open-array antennas that are compatible with Simrad’s NSS and NSO evo2 multifunction displays, and sell for $5,500, $5,000 and $4,500 respectively. Halo-3 and Halo-4 are available now, while Halo-6 will begin shipping in August. 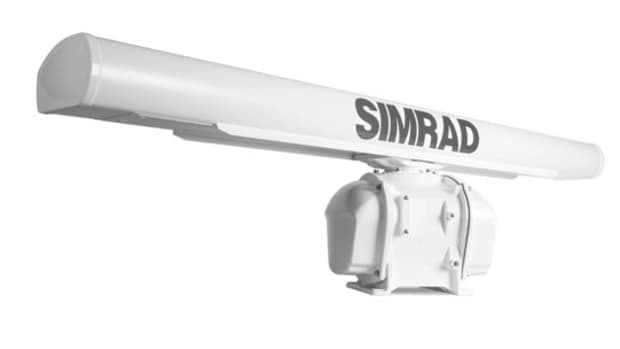 Simrad says the brushless motors and helical gears that turn the antennas are maintenance free and operate quietly, (43 decibels at 48 rpm), and that the solid-state transmitter will not degrade over its 10,000-hour service life. “It has no magnetron,” says Don Korte, senior radar product manager for Simrad. “It’s powered to 25 watts using Gallium nitride. It’s a new type of technology that is in cell-phone towers now and in military radars.” Instead of the 4- and 6-kilowatt magnetrons you know from conventional open-array pulse radar, the new system uses a spread-spectrum X-band transmitter to deliver a signal using what’s called “pulse compression.” Simrad describes the signal as similar to the CHIRP used in the company’s latest sonar products. Moreover, as Halo ranges out, the signal burst is comprised of as many as six different pulse lengths consisting of a range of frequencies, rather than just one, that upon echo return provide large amounts of data about the distance and direction of targets. 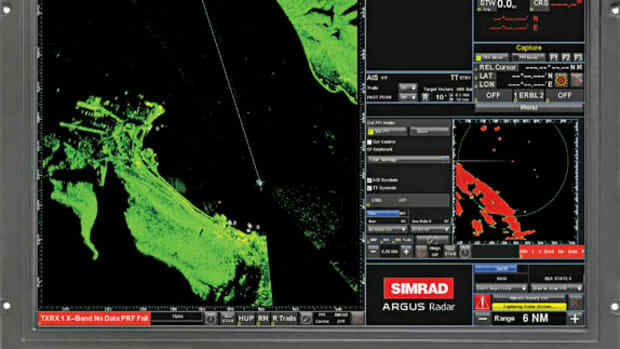 Simrad’s designers understood that short pulses provide good minimum range, but poor long range performance. At the same time—you guessed it—long pulses work well at long range but don’t do so well up close. 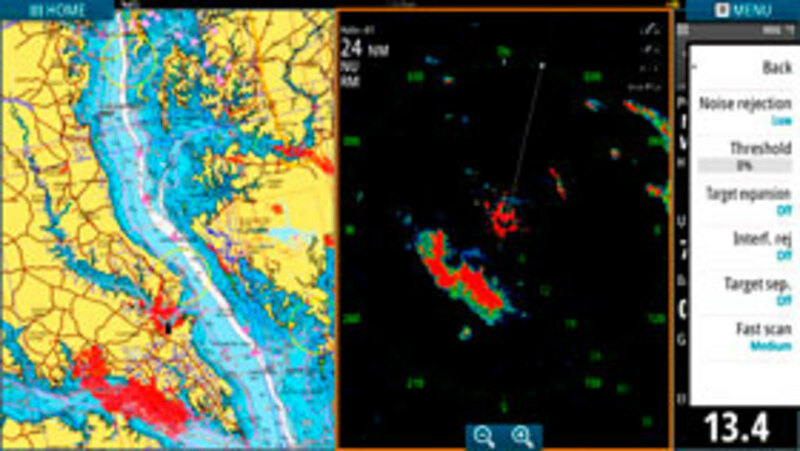 In layman’s terms, Simrad decided to transmit waves of a variety of frequencies every time, so the system will be effective over its full range, which the company says stretches from 20 feet to 72 nautical miles out (for Halo-6). The idea is that the radar will work just as well in close as far away. Since the various signals contained within the pulse—“chirps” for simplicity’s sake— are effective at different ranges, they capture data from those respective ranges. Think of it as concentric circles of data, around the boat. As Korte says, an initial burst of that short pulse gathers data that goes in the “doughnut hole,” where the boat is. The data from the next “chirp” fills in the ring around that, which is also the blind zone for the third chirp. Halo transmits from 500 to 2,000 bursts per second. 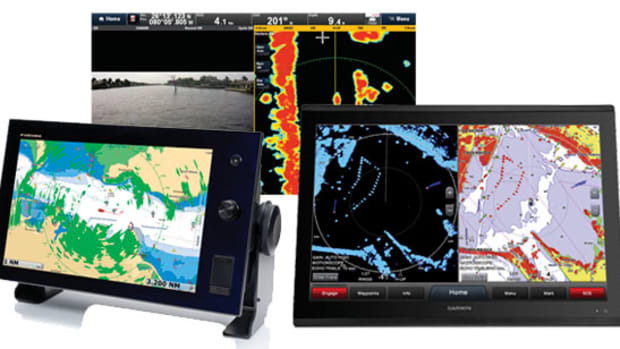 More data in equals more data out—a prospect that seems especially true across all marine-electronics brands since processing power in our helm units has caught up with much of our other consumer electronics (see “Hertz So Good,” May 2015). Through the software, Korte says, Simrad has figured out how to “knit” together the data from each ring to form a coherent image. The additional data makes for more complex programming. The additional complexity under the hood can also equate to a simple yet powerful interface, including preset tuning modes that may allow relative newcomers to benefit from pro-level views. The presets are the default—manual tuning is the option. Simrad has added a feature called “beam sharpening,” a signal processing feature that the company first used to improve target separation on 4G radomes. 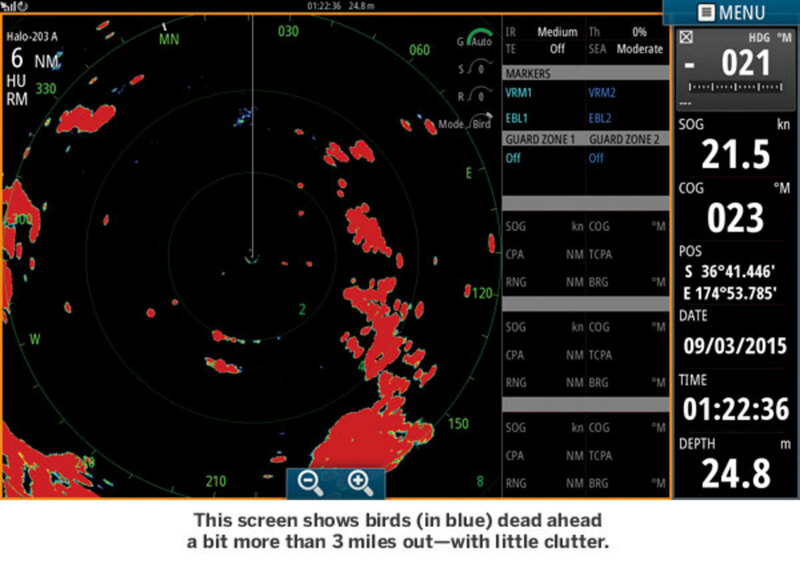 The user interface for the radar also has a mode to locate birds (a must-have for anglers). A harbor mode uses the unit’s best resolution for congested areas. Offshore mode reduces resolution to make isolated targets easier to see. “Many boaters’ biggest fear is messing some of the electronics up,” says Capt. Mark Maus, Simrad representative, product tester, and tournament captain. 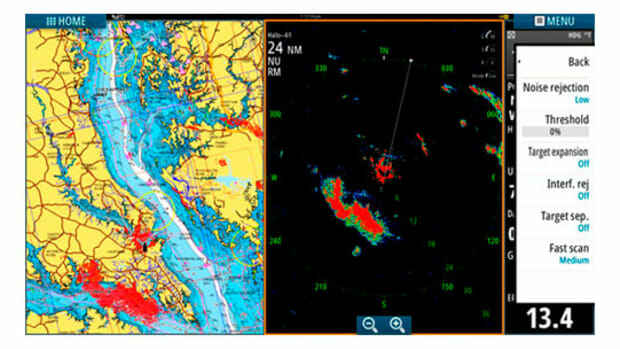 “And radar is the biggest black box—it’s like the deep hole for most people who operate a boat. Halo has these presettings. Mom and dad are going out on a cruise and go down the ICW, they’re going to run off the beach and set it to ‘harbor.’ Once they get away from the coast, they push ‘offshore’ and the radar readjusts itself for them. Even with the presettings I’m able to adjust the radar, so it works as you get more knowledgeable, too.” Additional presets may be added and installed in future software upgrades. Halo will be a boon to cruisers if its weather sensitivity turns out to be as consistent as the screen grabs I’ve seen. One depicted the Halo-4 (the midrange model in the series) spotting elements of a storm more than 65 miles away (with an advertised 64-nm range). With new technology, it’s where the rubber meets the road that matters, and we’ll be curious to put Halo (and hopefully other systems) to the test and hear reports of long service and hard sea time. And we’ll see if the technology helps boaters be safer and better informed when darkness falls and the seas kick up. This article originally appeared in the June 2015 issue of Power & Motoryacht magazine.